Well on the 17th of May I was truing out my new goggle maps ,I decided to visit the King's house in Graceland and take a tour/ I for some reason zoomed in on Elvis' grave. I was shocked by what I saw next to Elvis' tomb on the ground. 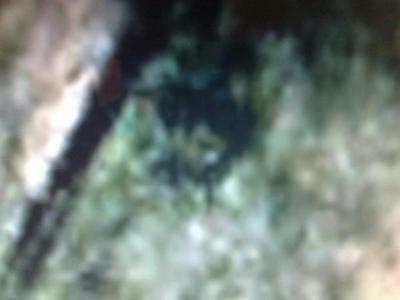 It appeared to be image or apparition of a ghost coming out of the ground. If you look you will notice sideburns and more features but it is not human. I have also made a clip on Youtube look my Youtube account Iceelvis on the search. I have captured several images before that defy logic other places. Perhaps I am psychic and I'm in tune with spirits. It's realy nice and it does look like the king but to me looks like it could just be how the grass is. I realy dont tink it's a ghosts!!! Wow great pic. Looks just like Elvis. I have heard that Elvis' ghost has been seen peering out from Graceland. A lot of people have claimed to have seen him. What the H.. are you takling about??? Your photo is really cool, but if Mama finds out, we'll be driving back to Graceland....again! Joking aside, I saw Elvis right away. I don't know if it's "for real", but if so, WOW!